Boxing superstar Manny Pacquiao officially started his basketball career as he played under the new team Kia Sorento in the PBA Season 40 first game on Sunday, October 19 at the Philippine Arena in Bulacan. Pacquiao, 35, is considered the oldest rookie in league history. The Sarangani Congressman became Kia's starting five in a game against Blackwater Elite. Pacquiao exits with a little over five minutes left in the first quarter as his team's performance is not good with the Blackwater leads, 21-12. Before the game, a video featuring announcer Michael Buffer — "Let's get ready to rumble!" — was aired to hype Pacquiao's debut. 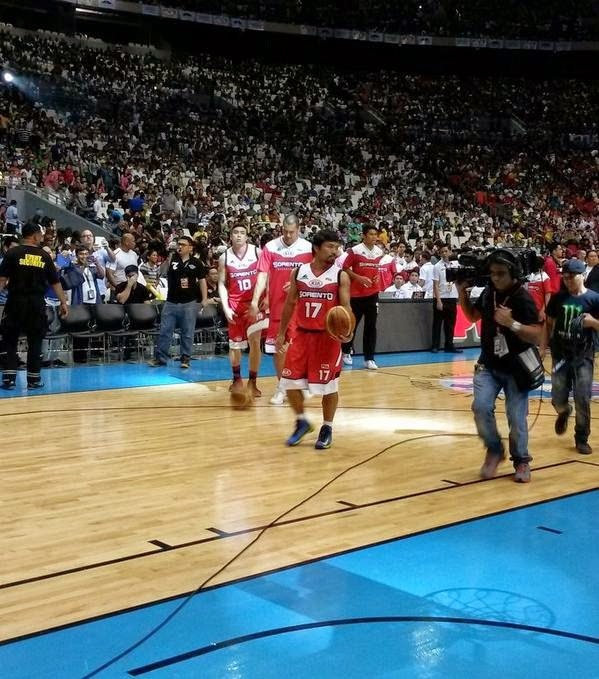 In an interview during the half time, Pacquiao thanked his fans for the support to him and to Kia. It was announced that Pacquiao asked permission from trainer Freddie Roach to play in the game, with the understanding that the boxer will return to General Santos City on Monday to continue training for his fight against Chris Algieri. Manny Paquiao became the subject of online conversations on microblogging site Twitter with 'Manny' and 'Pacman' among the trending topics.